The Overpainting example shows how QPainter can be used to overpaint a scene rendered using OpenGL in a QGLWidget. QGLWidget provides a widget with integrated OpenGL graphics support that enables 3D graphics to be displayed using normal OpenGL calls, yet also behaves like any other standard Qt widget with support for signals and slots, properties, and Qt's action system. Usually, QGLWidget is subclassed to display a pure 3D scene; the developer reimplements initializeGL() to initialize any required resources, resizeGL() to set up the projection and viewport, and paintGL() to perform the OpenGL calls needed to render the scene. However, it is possible to subclass QGLWidget differently to allow 2D graphics, drawn using QPainter, to be painted over a scene rendered using OpenGL. In this example, we demonstrate how this is done by reusing the code from the Hello GL example to provide a 3D scene, and painting over it with some translucent 2D graphics. Instead of examining each class in detail, we only cover the parts of the GLWidget class that enable overpainting, and provide more detailed discussion in the final section of this document. As usual, the widget uses initializeGL() to set up objects for our scene and perform other OpenGL initialization tasks. The resizeGL() function is used to ensure that the 3D graphics in the scene are transformed correctly to the 2D viewport displayed in the widget. Instead of implementing paintGL() to handle updates to the widget, we implement a normal QWidget::paintEvent(). This allows us to mix OpenGL calls and QPainter operations in a controlled way. In this example, we also implement QWidget::showEvent() to help with the initialization of the 2D graphics used. The new private member functions and variables relate exclusively to the 2D graphics and animation. The animate() slot is called periodically by the animationTimer to update the widget; the createBubbles() function initializes the bubbles list with instances of a helper class used to draw the animation; the formatInstructions() function is responsible for a semi-transparent messages that is also overpainted onto the OpenGL scene. For a small performance improvement, we set the widget's Qt::WA_NoSystemBackground attribute to instruct the underlying window system not to paint a background for the widget. The initializeGL() function is fairly minimal, only setting up the display list used in the scene. To cooperate fully with QPainter, we defer matrix stack operations and attribute initialization until the widget needs to be updated. In this example, we implement paintEvent() rather than paintGL() to render our scene. 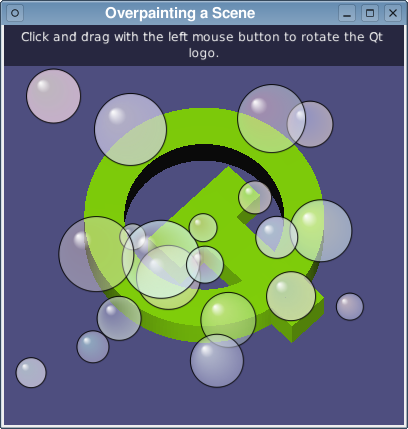 When drawing on a QGLWidget, the paint engine used by QPainter performs certain operations that change the states of the OpenGL implementation's matrix and property stacks. Therefore, it is necessary to make all the OpenGL calls to display the 3D graphics before we construct a QPainter to draw the 2D overlay. We define a color to use for the widget's background, and set up various attributes that define how the scene will be rendered. We call the setupViewport() private function to set up the projection used for the scene. This is unnecessary in OpenGL examples that implement the paintGL() function because the matrix stacks are usually unmodified between calls to resizeGL() and paintGL(). When QPainter::end() is called, suitable OpenGL-specific calls are made to write the scene, and its additional contents, onto the widget. Additionally, we take the opportunity to format the instructions to fit the width of the viewport. Ideally, we want to arrange the 2D graphics to suit the widget's dimensions. To achieve this, we implement the showEvent() handler, creating new graphic elements (bubbles) if necessary at appropriate positions in the widget. This function only has an effect if less than 20 bubbles have already been created. The animate() slot is called every time the widget's animationTimer emits the timeout() signal. This keeps the bubbles moving around. We simply iterate over the bubbles in the bubbles list, updating the widget before and after each of them is moved. The setupViewport() function is called from paintEvent() and resizeGL(). The drawInstructions() function is used to prepare some basic instructions that will be painted with the other 2D graphics over the 3D scene. QString text = tr("Click and drag with the left mouse button "
The instructions are painted directly onto the widget using the QPainter supplied by the paintEvent() handler function. Reimplement QGLWidget::initializeGL(), but only perform minimal initialization. QPainter will perform its own initialization routines, modifying the matrix and property stacks, so it is better to defer certain initialization tasks until just before you render the 3D scene. Reimplement QGLWidget::resizeGL() as in the pure 3D case. Reimplement QWidget::paintEvent() to draw both 2D and 3D graphics. Push the current OpenGL modelview matrix onto a stack. Perform initialization tasks usually done in the initializeGL() function. Perform code that would normally be located in the widget's resizeGL() function to set the correct perspective transformation and set up the viewport. Render the scene using OpenGL calls. Pop the OpenGL modelview matrix off the stack.